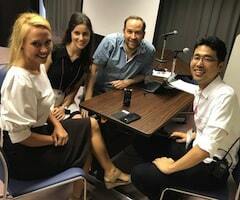 Dr. Shelly Jo Kraft and Dr. Keiichi Yasu join Kerianne Druker and Dr. Tom Weidig at the One World, Many Voices: Science and Community World Congress in Hiroshima, Japan to discuss the physical aspects of stuttering related to genes and brain structure. The group also discusses subgroups in stuttering research. Shelly Jo Kraft is an associate professor in the Department of Communication Sciences and Disorders at Wayne State University. Her primary research area is the etiology of early stuttering disorders, with specific focus on the role of genetics. Keiichi Yasu is a faculty member at Tsukuba University of Technology in Japan. He is working on neuroscience and behavioural aspect of stuttering. Dr. Tom Weidig resides in Luxembourg. He is co-chair of the International Fluency Association’s Research & Publication Committee and the brain behind the popular and widely read Stuttering Brain Blog.